Dogs often misbehave because they lack self-control. This lack of control is at the root of a number of behavior problems, including jumping up, bolting out the door, and demanding attention. You can begin to get some control over your dog's behavior by putting it to work. 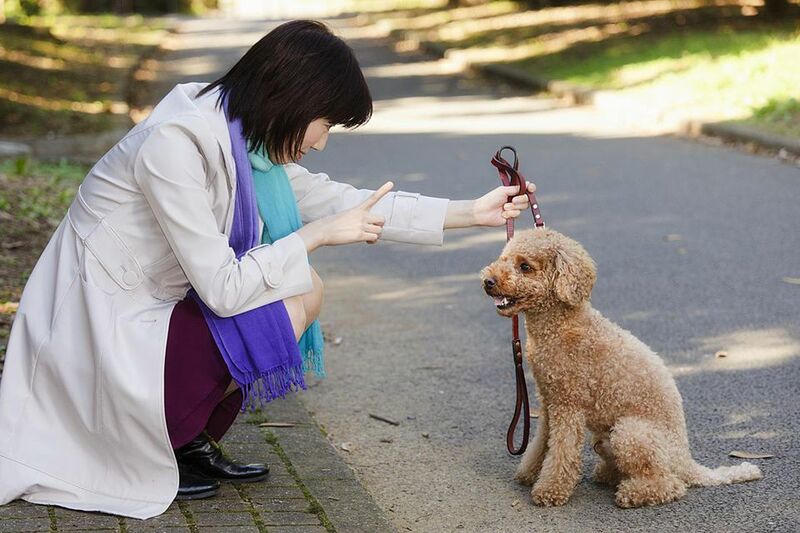 This means that you are going to ask your dog to do something for you, such as sitting or lying down, before it is allowed to do the things it wants to do, like eating, going for a walk, or playing a game with you. Many dog trainers refer to this as "Nothing In Life is Free" (NILF). Nothing In Life is Free doesn't replace training your dog to prevent specific behaviors. Rather, it reinforces the other training you are working on. It allows you to establish your role as the leader and helps to build your dog's confidence. You should train your dog the ​sit and ​down commands before you begin working on NILF. You will be asking it to do these things frequently, so it's critical that your dog knows them very well before you start. You can teach other commands to use with this program as well, but these two are the foundation for developing self-control. They're also pretty easy for dogs to learn. Once your dog knows a few simple commands, it's time to put them to work. Dogs tend to get excited at mealtimes. Your dog may jump on the counter as you prepare its dinner or pounce on you before you can get the bowl on the floor. Instead of allowing your dog to misbehave, make it work for its dinner. As you are preparing your dog's meal, give the command "sit" or "down." The dog must sit calmly until its meal is placed on the floor before it is allowed to eat. If it jumps up before you have the bowl in place, pick up the bowl and put it away. Walk away for several minutes, and then return and again ask your dog to sit or lie down. As soon as it does so calmly, place the food on the floor and allow the dog to eat. Your dog should never be allowed to bolt out the door. If your dog is allowed to play off-leash in your yard, do not let it step out while jumping or scratching on the door. Instead, ask the dog to sit first. If it refuses to sit, walk away from the door for several minutes, and then return and try again. As soon as the dog is sitting, you can open the door and let it outside. The same goes for taking your dog for a walk on a leash. Before your dog is allowed to go out, it must sit calmly while you put on the leash. If it refuses, walk away. Give the dog a few minutes to calm down, and then return and ask it to sit again. As soon as it sits, attach the leash and head for the door. When you reach the door, ask for a sit once again. If your dog refuses this, walk it away from the door, and try again in a few minutes. Most dog owners love playing and cuddling with their dogs. It can get annoying, however, when your dog is constantly demanding your attention by nudging its head under your hand or pawing at you. Again, you can make your dog work for your attention. Ask your dog to perform a behavior, such as sitting or lying down, before you pet it or play a game. If the dog tries to demand your attention, stand up and walk away. Once it sits or lies down when you give the command, you can play and cuddle for as long as you like. When you start working on NILF, your dog's behavior may seem to get a little worse before it gets better. Be patient. After you walk away from your dog a few times, it will begin to understand that it's not going to get what it wants until it does as you ask. If you pair NILF with obedience training, you should see a big improvement in your dog's behavior. They may even surprise you by sitting down patiently before you even give a command! As your dog progresses, proof each of the newly learned behaviors in different situations to instill self-control even more. For instance, have someone your dog absolutely loves standing outside the door so your dog can see them. Give your commands and don't release your dog out the door until they obey.